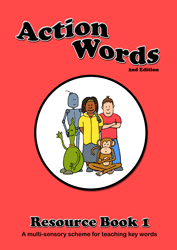 See 28 sample pages from the first Action words Resource Book. A photocopiable resource teaching the following 45 high frequency words. Mum, Dad, my, you, said, I, he, she, no, can, yes, to, going, are, am, look, in, up, get, all, this, is, dog, for, the, we, like, went, they, and, play, on, come, big, see, go, away, was, it, a, cat, at, day, of, me.